Wat Pothisomphon, near Nong Prajak Park, is the major Buddhist temple in Udon Thani. 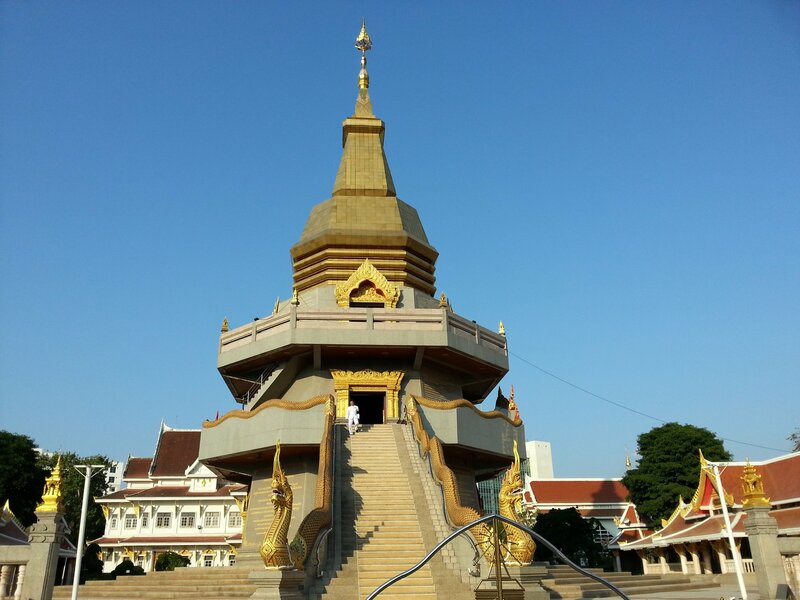 Wat Pothisomphon is open every day from 06:30 to 18:00 and admission is free. 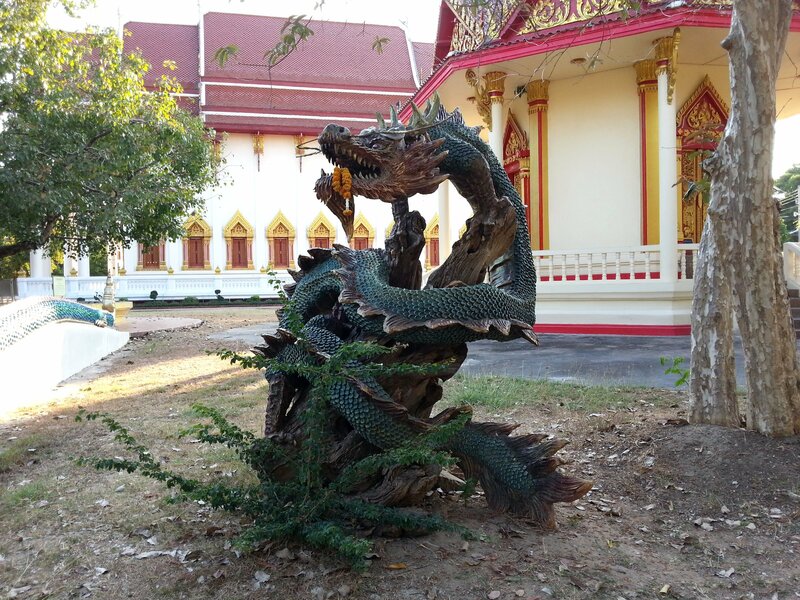 Wat Pothisomphon is a 20th Century temple set within large grounds in the centre of Udon Thani. 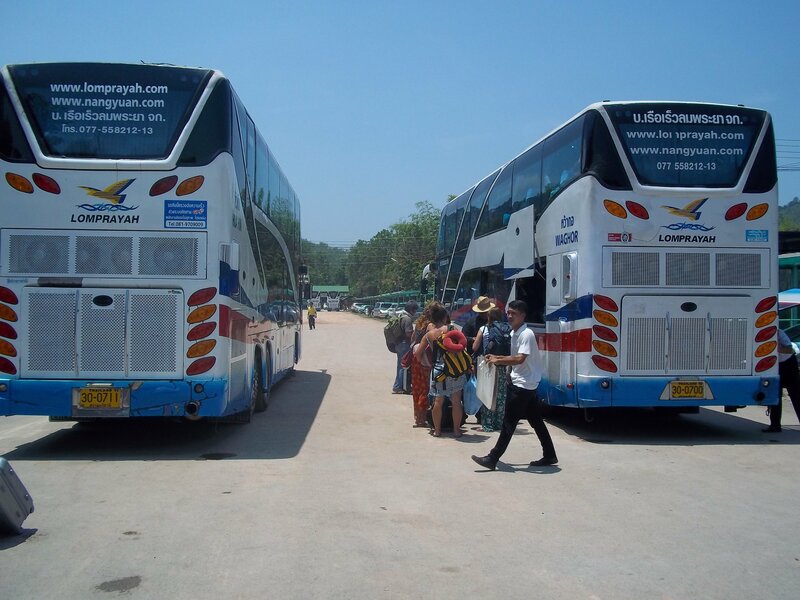 There are several points of interest at Wat Pothisomphon which make it worth while visiting. 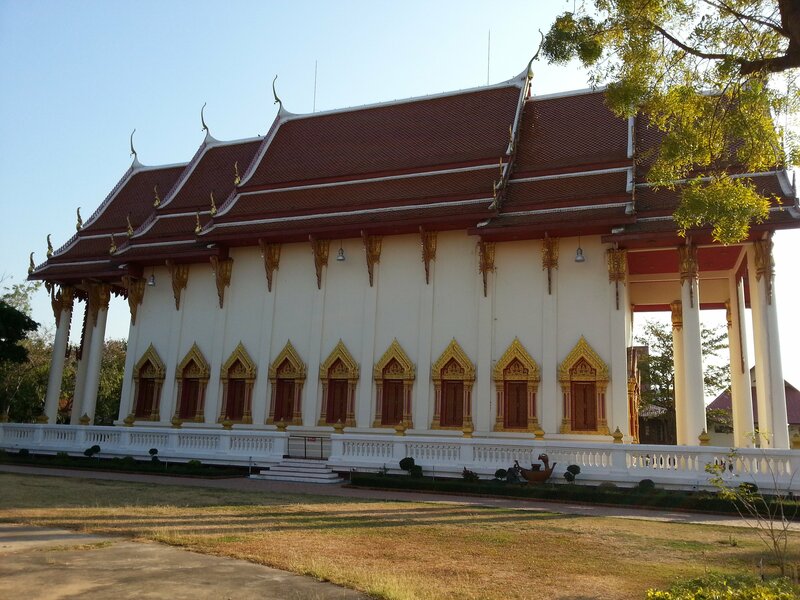 Wat Pothisomphon has a large ordination hall in the Central Thailand style. The ordination hall is, unfortunately, kept locked so you can’t see what it inside. However, at the rear of the temple is a Buddha statue which, according to the information plaque, is 1,300 years old. 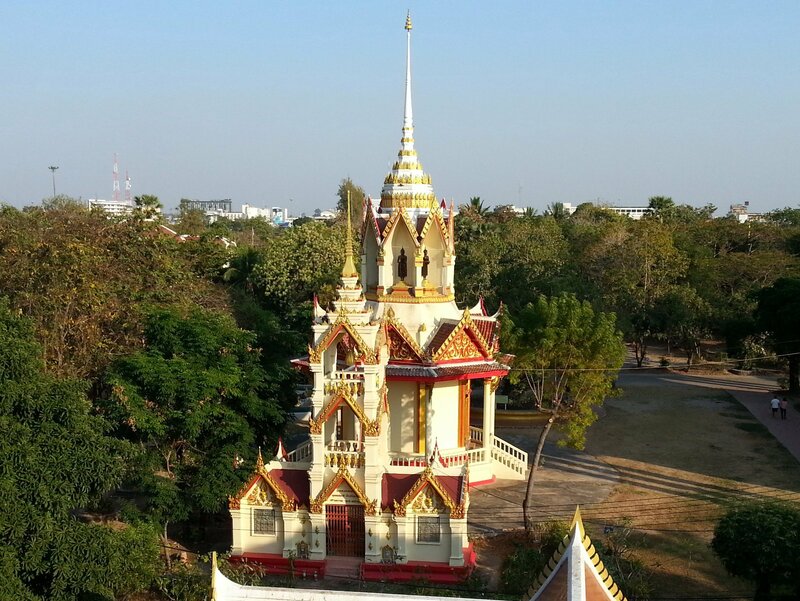 Wat Pothisomphon also has an interesting bell tower and adjacent chedi both both painted white, with gold relief and red roofs matching the style of the ordination hall. Both structures of modern interpretations of older Laotian style temple buildings and architecturally interesting as they differ from what you normally find in temples in Thailand. Wat Pothisomphon also features a range of statues and sculptures dotted around the grounds relating to Buddhism and South East Asian mythology. The Naga shrine near the smaller white chedi is particularly noteworthy. The best known feature of Wat Pothisomphon is the golden chedi which was completed in 2009. 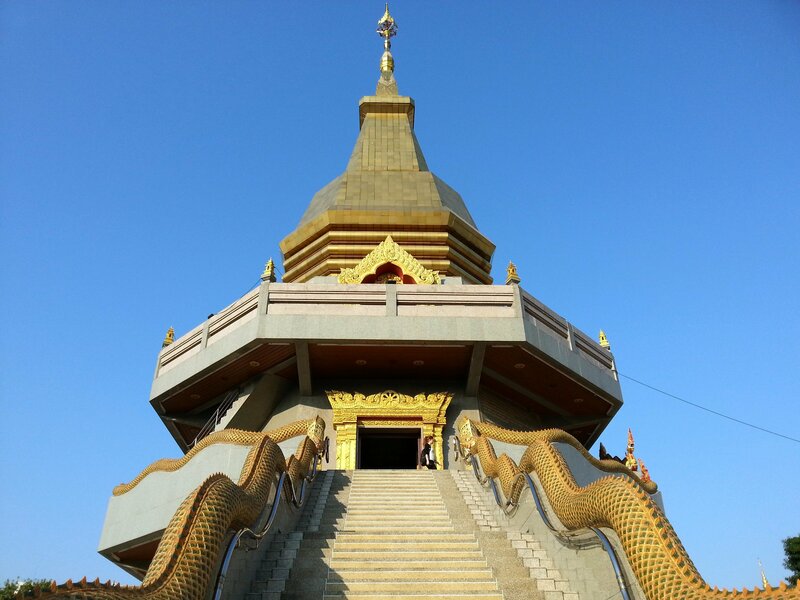 This tall chedi has room on three floors and a grand stairway leading to the top. The views from the chedi, of the temple grounds and the town, are good and a reason to visit Wat Pothisomphon in their own right. The top room in the chedi Wat Pothisomphon features a shrine to the Lord Buddha. 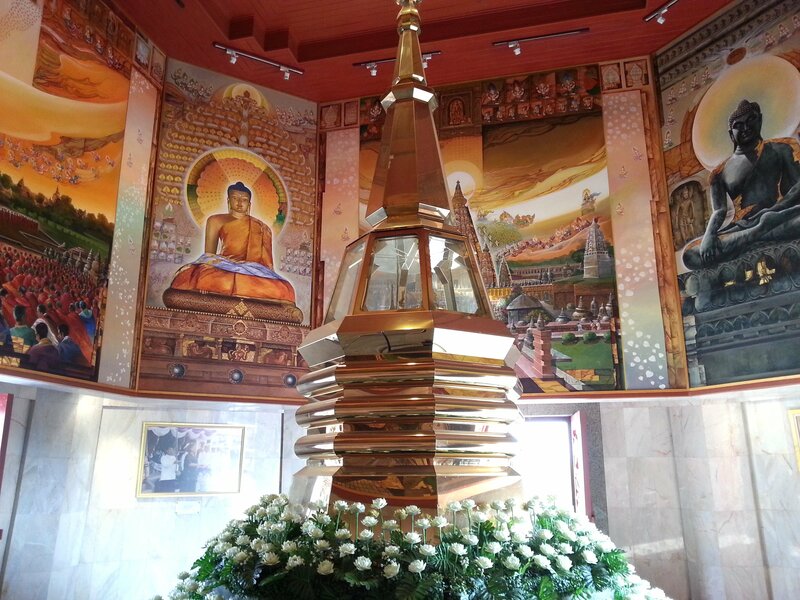 On each of the wall panels is a series of paintings each depicting a significant part of the Lord Buddha’s life including his birth, his enlightenment, his first sermon and his death. The second floor of the chedi features replicas of important Buddha statues, including a replica of the Emerald Buddha which is kept at Wat Phra Kaew in Bangkok. 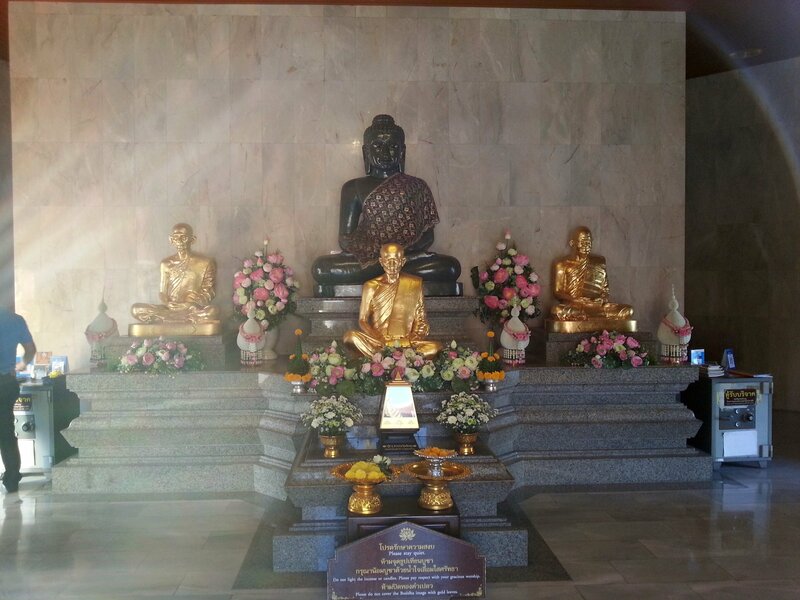 The lower floor room in the chedi is dedicated to Ajahn Maha Bua, also known as Luang Ta Maha Bua, who was an important monk who lead the Forest Tradition sect of the Thai Buddhist church from 1994 until his death in 2011. 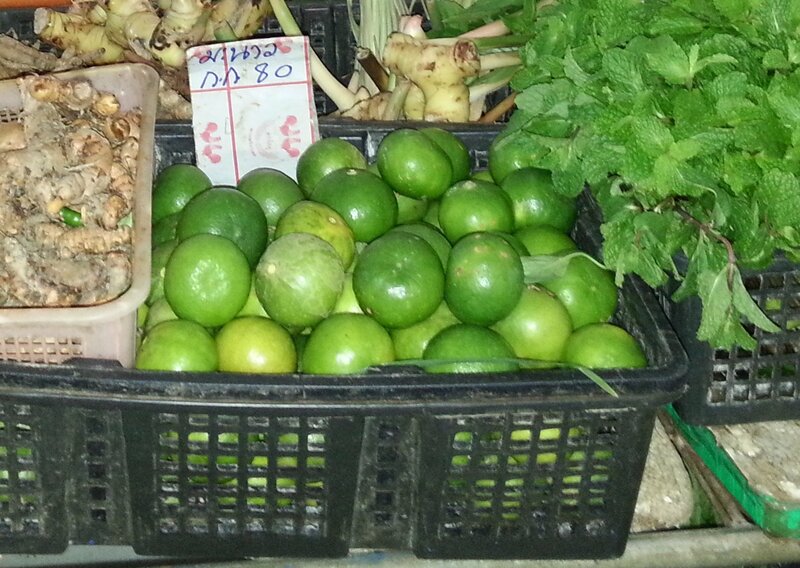 Luang Ta Maha Bua is revered by many Thai Buddhists in similar way to a saint in the Christian tradition. 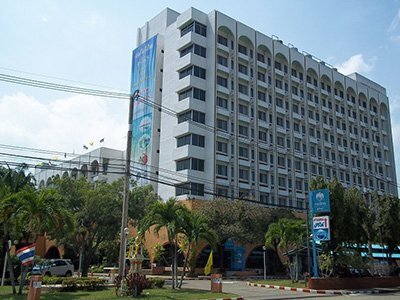 Wat Pothisomphon is located 3.4 km from Udon Thani Railway Station.